The two species of the Cannabis genus that are most commonly grown are Cannabis indica and Cannabis sativa. A third species, Cannabis ruderalis, is very short and produces only trace amounts of tetrahydrocannabinol (THC), and thus is not commonly grown for industrial, recreational or medicinal use. However, because Cannabis ruderalis flowers independently of the photoperiod and according to age, it has been used to breed autoflowering strains. There is an increasing discussion whether the existing paradigm of the difference between species adequately represents the variability found within the genus Cannabis. There are five chemotaxonomic types of Cannabis: one with high levels of THC, one which is more fibrous and has higher levels of CBD, one that is an intermediate between the two, another one with high levels of cannabigerol (CBG), and the last one almost without cannabinoids. There has also been a recent movement  to characterize strains based on their reported subjective effects. For example, WoahStork has used machine learning algorithms to classify strains into six Distinct Activity groups. In addition to pure indica, sativa, and ruderalis varieties, hybrid varieties with varying ratios of these three types are common. 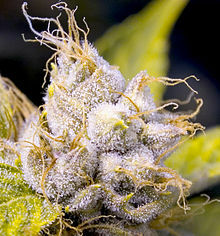 For example, the White Widow hybrid containing about 60% indica and 40% sativa ancestry. These hybrid varieties exhibit traits from both parental types. There are also commercial crossbred hybrids which contain a mix of both ruderalis, indica or sativa genes, and are usually autoflowering varieties. These varieties are bred mostly for the medicinal cannabis market, since they are not very appreciated by recreational cannabis users because ruderalis varieties are lower in THC and impart a slightly unpleasant taste. “Lowryder” was an early auto-flowering hybrid that retained the flowering behavior of ruderalis plants, while also producing appreciable amounts of THC and CBD. Autoflowering cannabis varieties have the advantage of being discreet due to their small stature. They also require shorter growing periods, as well as having the additional advantage that they do not rely on a change in the photoperiod to determine when to flower. A common technique to stabilize a cannabis variety is called “cubing”. A breeder seeking specific traits in the hybrid offspring (for example, greater resin production or tighter node spacing) will breed hybrid plants most exemplifying these characteristics with a parent plant. The same traits are sought in the new inbred offspring, which are then again bred with the original parent plant. This process is called cubing because it usually repeated across three, or possibly more generations before the variety’s genetics are acceptably stable. In a retail market that is decriminalised such as in The Netherlands, where wholesale production is illegal but prosecutions are not always enforced because of the contradiction of the law that is recognised by the courts, competition puts pressure on breeders to create increasingly attractive varieties to maintain market share. Breeders give their strains distinct and memorable names in order to help differentiate them from their competitors’ strains, although they may in fact be very similar. Acapulco Gold is a golden-leafed Cannabis sativa strain originally from the Acapulco area of southwest Mexico. Bedrocan is a medicinal cannabis variety cultivated from a Dutch medical marijuana Cannabis sativa L. strain, having a standardized content of THC (22%) and CBD (1%). It is currently cultivated by Bedrocan Nederland, Bedrocan Canada and Bedrocan Česká Republika. It was first introduced in 2003 and is dispensed through pharmacies after prescription from a physician. Blue Dream is a hybrid cannabis strain widely used for both medical and recreational purposes first developed in 2003. Charlotte’s Web is a high-cannabidiol (CBD), low-tetrahydrocannabinol (THC) Cannabis extract marketed as a dietary supplement under federal law of the United States. It is produced by the Stanley brothers in Colorado. It does not induce the psychoactive “high” typically associated with recreational marijuana strains that are high in THC. In September 2014, the Stanleys announced that they would ensure that the product consistently contained less than 0.3% THC. Charlotte’s Web gained national attention when it was used to treat Charlotte Figi’s epileptic seizures. Her story has led to her being described as “the girl who is changing medical marijuana laws across America,” as well as the “most famous example of medicinal hemp use”. There is little evidence about the safety or efficacy of cannabinoids in the treatment of epilepsy. Tom Cruise Purple is a strain of cannabis sold in California by select licensed cannabis clubs. The strain is potent, and is packaged with a picture of the actor Tom Cruise laughing. Tom Cruise Purple is sold by cannabis purveyors in Northern California. Cruise sought out legal advice regarding the product, and considered a lawsuit against its manufacturers. Skunk refers to cannabis strains that are strong-smelling and have been likened to the smell of the spray from a skunk. These strains of cannabis are believed to have originated in the United States prior to development by Dutch growers. 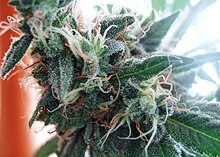 Just as with other strains of cannabis, skunk is commonly grown in controlled indoor environments under specialized grow lights, or in a greenhouse when full outdoor conditions are not suitable; skunk strains are hybrids of Cannabis sativa and Cannabis indica. Sour Diesel is a cannabis sativa dominant hybrid strain. ^ Small, E.; Cronquist, A. (1976). “A practical and natural taxonomy for Cannabis“. Taxon. 25 (4): 405–435. doi:10.2307/1220524. JSTOR 1220524. ^ Greg Green (2001). The Cannabis Grow Bible (4th ed.). p. 47. ^ Hillig, Karl W.; Mahlberg, Paul G. (2004). “A chemotaxonomic analysis of cannabinoid variation in Cannabis (Cannabaceae)”. American Journal of Botany. 91 (6): 966–975. doi:10.3732/ajb.91.6.966. PMID 21653452. ^ Halverson, Nic (July 6, 2012). “Marijuana That Doesn’t Get You Stoned”. Discovery Channel. Discovery Communications, LLC. Retrieved January 23, 2014. ^ Renolds, Robert (June 15, 2014). “Therapeutic Satisfaction and Subjective Effects of Different Strains of Pharmaceutical-Grade Cannabis” (PDF). Psychopharmacology. Wolters Kluwer – Lippincott Williams & Wilkins. Retrieved July 9, 2018. ^ Reggente, Nicco (February 15, 2016). “WoahStork’s Strain Activity Groups”. WoahStork. WoahStork. Retrieved March 15, 2016. ^ “Selfing – Cannabis Grow Bible”. Kindgreenbuds.com. Retrieved 2017-01-08. ^ Oct 20, 2014 (2014-10-20). “Dutch court refuses to punish illegal cannabis growers”. Phys.org. Retrieved 2017-01-08. ^ Partridge, Eric (2006). The New Partridge Dictionary of Slang and Unconventional English: A-I. Taylor & Francis. p. 4. ISBN 978-0-415-25937-8. ^ Central Intelligence Agency (13 December 2013). The CIA World Factbook 2012. Skyhorse Publishing Company, Incorporated. p. 44. ISBN 978-1-62873-181-1. ^ Green, Jonathon (2 October 2013). Dictionary of Jargon. Routledge. p. 4. ISBN 978-1-317-90818-0. ^ Backes, Michael (September 9, 2014). Cannabis Pharmacy: The Practical Guide to Medical Marijuana. Black Dog & Leventhal. pp. 124–125. ISBN 9781579129514. Retrieved 2017-03-12. ^ CNN (August 11, 2013), Weed: Dr. Sanjay Gupta Reports (full transcript), CNN, retrieved January 1, 2014 See full CNN video. ^ CNN (March 11, 2014), Weed 2: Cannabis Madness, Dr. Sanjay Gupta Reports (full transcript), CNN, retrieved March 15, 2014 CNN’s main page. See full CNN video. ^ Rosenthal, Ed (2007). More Marijuana Varieties from the World’s Great Seed Breeders, p. 134. ISBN 9780932551795. ^ Krugman, Milt (April 8, 2008). “Tom Cruise fuming”. Bucks County Courier Times. Levittown, Pennsylvania. ^ “Lanzan producto de marihuana con la imagen de Cruise”. Esmas.com (in Spanish). www.esmas.com. April 13, 2008. Archived from the original on January 11, 2010. Retrieved March 25, 2010. ^ “Tom Cruise ‘goes to pot’ over marijuana link”. The New Zealand Herald. APN News & Media. April 7, 2008. ^ a b “Medical high jinks leave Tom Cruise camp fuming”. New York Daily News. Mortimer Zuckerman. April 4, 2008. Retrieved March 25, 2010. ^ Reardanz, Karen (April 4, 2008). “Cruise Fumes Over Marijuana Association”. San Francisco Chronicle. Retrieved March 25, 2010. ^ Saar, Mayrav (April 4, 2008). “TomKat in a Huff over Tom Pot”. E! Online. E! Entertainment Television, Inc. Retrieved March 25, 2010. ^ WENN (April 4, 2008). “Cruise fumes over marijuana association”. World Entertainment News Network. Comtex. ^ “Report: ‘Tom Cruise Purple’ Medical Marijuana Has Actor Smoking Mad”. Fox News Channel. Fox News Network, LLC. April 4, 2008. Retrieved 25 March 2010. ^ a b “Skunk”. Archived from the original on 2016-03-06.